Sheffield Print Fair: Sheffield Print Fair 2017 - Call For Artists! 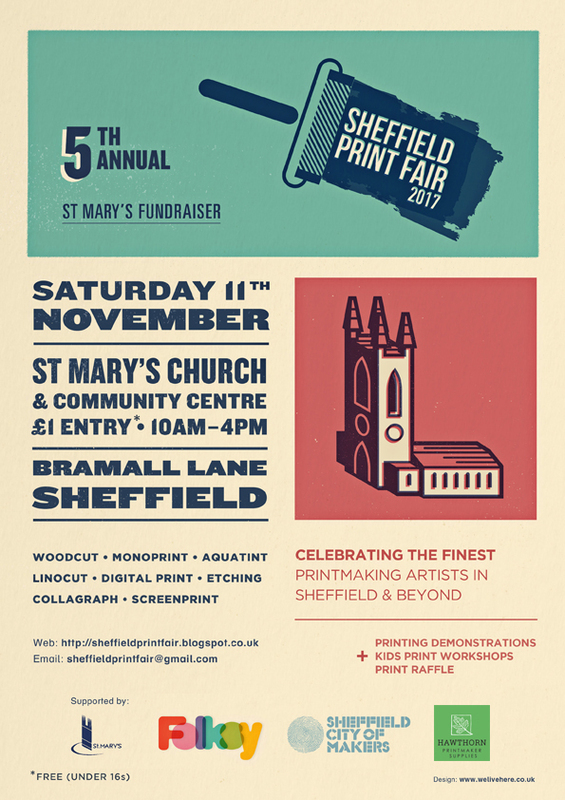 Sheffield Print Fair 2017 - Call For Artists! We are proud to launch the 5th annual 'Sheffield Print Fair', which will take place on Saturday 11th November 2017, at St Mary's Church & Community Centre, Bramall Lane, Sheffield. We are being supported by Folksy, as well a new partners in Sheffield City of Makers, an organisation which promotes creative practices in the city, and Hawthorn Printmaker Supplies, who will be at the fair with their presses and other printmaking goodies. The application deadline is 3rd September 2017, and we will inform all applicants of the result by 10th September 2017. Stalls are £55 each (a 6ftx2ft table), or £27.50 for a half-table. There is space behind each table for a display board if you wanted to bring one, and some room by the side for small print browsers.